Ancient Greece.com - This site has tons of useful information on the various aspects of Ancient Greek society. Odyssey Online's Greece - A fantastic interactive site that teaches a great deal about Hellenic culture. Mr. Donn's Ancient Greece - contains a great deal of information about life in ancient Greece. BBC Primary History: Ancient Greeks - a fantastic Ancient Greece site with resources, loads of info, a forum for discussion, and so much more! Ancient Worlds: The Hellenic World - a virtual Hellenic world! Perseus Digital Library - a digital library with thousands of texts, photos, and more! Alexander the Great - lots of useful info about Alexander the Great. Alexander the Great - all about the life of Alexander! BBC: Ancient Greece - information about the first Olympics, Athens and Democracy, other Greek cultures, and legends. Good stuff! Ancient Greece - great content and resources! Mr. Dowling: Ancient Greece - another great informative site from Mr. Dowling! PBS: The Greeks - a fantastic site with an interactive timeline, the Acropolis experience, the making of the Greeks, educational resources, and even a shop! Met Museum's Greek and Roman Art - a fantastic collection of ancient Greek and Roman art. The Trial of Socrates - all about the trial and execution of Socrates, one of the world's greatest philosophers. Art History: Ancient Greek Art - tons of great works of ancient Greek art are displayed here. Internet Ancient History Sourcebook: Greece - a fantastic collection of works about ancient Greece. Internet Ancient History Sourcebook: The Hellenic World - What is the Hellenic World? Check out these fantastic links! 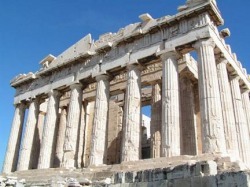 Ancient Greece - explore the amazing early culture that set the foundation of western civilization. Ancient Greek Picture Gallery - many great pictures of ancient Greece, including sculpture, art, architecture and more! Ancient Greece - History Link 101's Ancient Greece page connects you to the best of Art, Biographies, Daily Life, Maps, Pictures, and Research on Ancient Greece. Introduction to Greek Mythology - all about the Greek gods. Ancient Greek Art Lesson - an art lesson on Ancient Greece that helps give a basic foundation of knowledge of ancient Greece. The British Museum: Ancient Greece - a graphically intensive site that offers loads of great resources and information. Ancient Greece for Kids - find out about the government, mythology, architecture, religion, sports and games, clothing, literature, environment, philosophers, economy, food and warfare of the ancient Greeks. Exploring Ancient World Cultures: Greece - an introduction to ancient Greek culture.